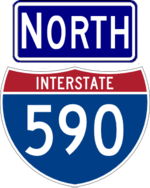 Interstate 590 is a short freeway connecting I-390 to I-490 and part of Rochester's "Outer Loop", originally designated NY 47. 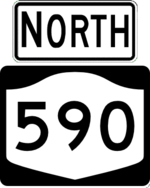 The freeway is continued as NY 590, which used to extend to Culver Road at Lake Ontario, prior to a project to replace the divided highway with a two lane parkway. 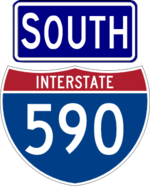 The I-590 designation was planned to cover the entire Outer Loop, but was truncated to I-390 when the extension of I-390 along NY 15 to downtown Rochester was cancelled. The designation was also planned to extend to NY 104, but this was denied by FHWA. 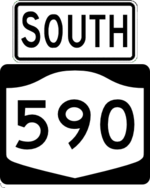 Webster Stubs exist on NY 104 for the NY 590 south to NY 104 east and NY 104 west to NY 590 north ramps.